In recognition of countless acts of heroism, bravery, and benevolence in the face of tragedy, the National Thoroughbred Racing Association (NTRA), Daily Racing Form and the National Turf Writers and Broadcasters (NTWAB) today announced that the Special Eclipse Award will be awarded to all responders who assisted in mitigating the year’s worst racehorse-related disasters – the hurricane that left more than 800 Thoroughbreds stranded with limited food and clean water at Puerto Rico’s Hipódromo Camarero in September and the wildfire that claimed 46 Thoroughbreds at Southern California’s San Luis Rey Training Center in December. 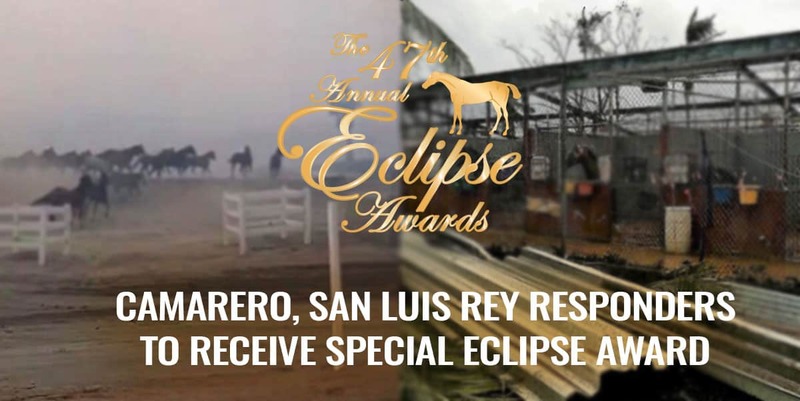 Representatives of the Camarero and San Luis Rey relief efforts will be on hand to accept the Special Award at the 47th Annual Eclipse Awards dinner and ceremony on Thursday, January 25, in the Sport of Kings Theatre at Gulfstream Park in Hallandale Beach, Fla. The Eclipse Awards are presented by Daily Racing Form, Breeders’ Cup and The Stronach Group, produced by the NTRA, and will air live on TVG at 8 p.m. ET/5 p.m. PT. Hurricane Maria struck Puerto Rico on Sept. 20, a Wednesday, as a Category 4 storm with wind gusts up to 118 miles per hour. All 3.4 million residents lost power and nearly all communications networks were knocked out of service. Storm surge and flash flooding left entire towns trapped until military relief could reach them as much as 24 hours later. Maria laid waste to the island’s only sanctioned racetrack, Hipódromo Camarero, formerly known as El Comandante, where Bold Forbes debuted in 1975 before winning the Kentucky Derby and Preakness the following season and where Puerto Rican natives Angel Cordero Jr. and John Velazquez rode early in their Hall of Fame careers. The grandstand of the Canóvanas track was destroyed, with the clubhouse “in ruins,” as track administrator Jose A. Maymó Azize said. Azize also estimated that 90 percent of the racehorse pens lost their roofs. There were 1,100 registered Thoroughbreds on the track grounds – more than half of which were bred in the U.S. – with limited access to food or clean water. And with so much human suffering on the island many of the horses no longer had caretakers. Miraculously no horses died during the storm, but for many the hardest days were still to come. In stepped Kelley Stobie and Shelley Blodgett of Caribbean Thoroughbred Aftercare, the nonprofit organization with more than a decade of experience transitioning hundreds of racehorses from Puerto Rico and the Virgin Islands for post-racing lives, both on the islands and back on the U.S. mainland. Stobie recruited help from the few grooms she could find that were still there tending to their horses. By Monday, five days since Maria first made landfall, Stobie was still clearing access to horses who hadn’t had any water. Stobie was able to call her CTA co-founder Blodgett, a racing fan and recently retired clinical psychologist in Wellington, Fla., who had helped re-home several horses from Puerto Rico to the U.S.
Major support and coordination throughout came from Thoroughbred Charities of America (TCA), The Jockey Club, The Humane Society of the United States, the American Association of Equine Practitioners, and Ranch Aid, a FEMA-appointed organization that assists with logistics and care for large animals during natural disasters. Among many others that stepped up to answer Blodgett’s plea with donations of feed, veterinary supplies, aircraft, warehouse space, and other needs were: Bonnie Heath Farm, Brook Ledge Horse Transportation, Cargill Animal Nutrition, Eisaman Equine, Horse America, Heidel Hollow Farm, JetBlue, MWI Animal Health, Ocala Breeders’ Sales Company, Purina Animal Nutrition, Texas Equine Veterinary Association, TFB Equine, The Ark at JFK, Thoroughbred Aftercare Alliance, Thoroughbred Retirement Foundation, and U.S. Equestrian Federation. Terry Finley and Vince Viola, partners in Kentucky Derby winner Always Dreaming, helped cut through bureaucratic red tape for relief flights to be cleared to land on the devastated island. On Oct. 3, a charter jet arrived in Puerto Rico with 20 tons of alfalfa, veterinary supplies, including fluids and penicillin, and two satellite phones. It was the first of three planeloads that would come bearing donations from individuals and industry organizations. At least 98 horses from the Camarero backside have been euthanized, nearly all from colic or laminitis, with more likely to follow. Track veterinarian Dr. Ricardo Loinaz has worked nonstop at the on-site equine hospital caring for horses with serious injuries or requiring antibiotics. While nutritional needs have been addressed, most of the damaged barns remain unrepaired. Said Stobie: “It was mostly colic to start, and then about a month after the storm they were foundering from standing in water and on cement for so long. That was when we had no choice but to start euthanizing horses. Not a lot of them have been euthanized for other ailments or fractures or anything. Stobie and Blodgett will attend the Eclipse Awards ceremony to accept the Special Eclipse Award on behalf of countless individuals that participated in the relief effort. It started as a minor brush fire, first spotted in the late morning of Dec. 7 in northwest San Diego County. Fanned by unusually strong Santa Ana winds, though, with gusts of more than 60 miles per hour, within 30 minutes the fire had consumed 50 acres. Within the next hour it spread to 500 acres. By early afternoon, the blaze had expanded westward to the San Luis Rey Training Center in Bonsall, Calif., where about 450 Thoroughbred racehorses were stabled. As the Lilac Fire encroached, horsemen did what they could to protect their barns, dousing roofs with water from hoses. Training center staff smothered flames with dirt as spot fires popped up. Vans were summoned for emergency evacuation, but most found they could no longer access the training center, or could not make it in time. The 2017 California wildfire season had been the worst on record, including five of the 20 most destructive fires in the state’s history, and drought conditions had left much of the land unusually prone to ignition. Between the wind and the dry fuels, the fire was gaining in size and strength by the minute. The trainers, assistant trainers, foremen, and grooms on the scene faced agonizing decisions as the fire moved across the property in scattershot fashion, from hillside to barn roof, sometimes by way of blazing palm trees, depending on where windswept sparks might take. Do they leave the horses in their stalls a little longer, in case help arrives, or do they let them free to fend for themselves, despite the obvious risks of allowing animals that have been contained and supervised their entire lives to run wild? And how long should the humans even stay to care for these horses when their way out could be cut off? Most of the horsemen stayed, risking their own well-being in hopes of saving their charges. When no other options were left, stall doors were opened and horses were pulled out, let loose to find their own way on the training track, the infield, or the burning barn area. Horses still trapped could be heard screaming as they caught fire and burned in their stalls. Leo Tapia, a groom for trainer Peter Miller, broadcast live video on Facebook that showed the horror as it unfolded. Tapia ran into one of his barns, unlatching stall guards and urging horses to flee, even as smoke consumed the shedrow and the 23-year-old Mexican choked for air. Outside the barn, Tapia continued to document the scene as scores of frightened, loose horses ran in search of safety. The harrowing 10-minute video has more than 256,000 shares and 15 million views. “I wanted people to realize the magnitude of the tragedy,” Tapia said. As reported by Jeremy Balan of Blood-Horse this week, Martine Bellocq raced into her burning barn attempting to save an unraced 2-year-old, Wild Bill Hickory. The trainer suffered third-degree burns over 60 percent of her body and was unable to rescue the colt. Fellow trainer Manuel Cavario, stabled in the same barn with Bellocq, saw his neighbor engulfed in flames and snuffed them out with a blanket, perhaps saving her from an even worse fate. Pierre Bellocq Jr., who had been loading another of their horses onto a van, returned to find his wife slumped on the ground, still burning and crying for Wild Bill Hickory. Martine was airlifted to UC San Diego Medical Center, Hillcrest, and placed in a medically induced coma. She remains under significant sedation and can’t speak. Two additional horsemen suffered serious injuries – trainer Joe Herrick sustained second- and third-degree burns on his face, neck, arms, and hands while pulling 2-year-old filly Lovely Finish from his burning barn, and outrider Les Baker broke nine ribs and suffered facial lacerations when trampled by a fleeing herd. Forty-six horses died from the fire, according to the California Horse Racing Board. Nine of San Luis Rey’s 15 barns were destroyed. A few days later, San Luis Rey general manager Kevin Habell gave Daily Racing Form executive columnist Jay Hovdey a tour of the aftermath, pointing out the skeletal remains of the barn of Scott Hansen, who lost 15 horses, as well as those of Herrick, Miller, and Cliff Sise, who each lost five. Sise has been lauded for freeing the horses of other trainers who weren’t present at the time. About 250 horses from San Luis Rey were evacuated to the Del Mar Thoroughbred Club, which provided sanctuary to more than 800 animals. Others from San Luis Rey were either walked or vanned to surrounding farms, many by locals who rushed to the scene to lend a hand. Early the next morning, after the 4,100-acre fire was controlled and survivors had been relocated, hundreds of volunteers arrived at Del Mar at 2 a.m. to fill water buckets and watch for colic. Many came bearing supplies for horses and barn workers. A GoFundMe site to raise money for the horsemen most severely impacted raised more than $650,000, led by $50,000 from the Spendthrift Farm of Southern California racing fixture B. Wayne Hughes (who also sent veterinary supplies and volunteers on a private plane from Kentucky) and five-digit donations from several prominent horsemen and industry groups.